Many new books on the Civil War are released every year, but it's hard to find a good account on the war that shaped many of the men who took command -- the conflict between the United States and Mexico. First published in 1989 and recently re-released in paperback, John Eisenhower's splendid history fills the bill. 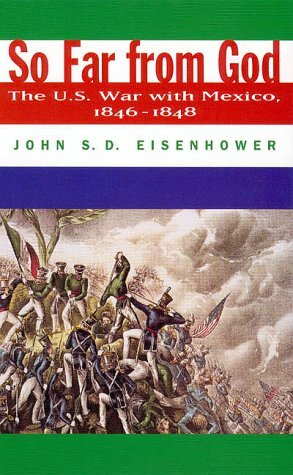 In lively, well-written prose, Eisenhower delves into the personalities and events that provoked the conflict with Mexico and led to the United States' eventual acquisition of South Texas, New Mexico, Arizona, and California. In the mid-nineteenth century, the United States was determined to expand -- and James Knox Polk was the president to do it. Dour and humorless, Polk pursued expansionism despite the unpopularity of the war and the mistrust he felt for his generals. But this isn't Polk's story so much as Zachary Taylor's and Winfield Scott's, the two generals who led the American fighting forces in Mexico. A study in contrasts, these two men had the unenviable task of assembling an untried army of regulars and volunteers in an inhospitable desert, at a time when communications and transportation were carried out mostly by horse and mule. Pompous and overbearing, Scott managed to beat Taylor out for general-in-chief -- only to see Taylor surpass him in popularity and go on to win the presidency. The title of this book refers to a famous quote from Mexican President Porfirio Diaz: "Poor Mexico! So far from God, and so close to the United States." But you'll end up feeling sorry for the fighting men on both sides. The Mexican Army was plagued by venal and corrupt leaders, especially Santa Anna, who managed to lose the war despite having geographic and numerical advantage. The Americans fared little better, suffering 13,780 dead -- only 1 in 8 from combat. If you're looking for a blow-by-blow account of what your favorite Civil War heroes did in the Mexican War, you might be better off with Jack Waugh's "Class of 1846." This book deals with the war on a bigger stage -- but it does so splendidly. For a good general history of the conflict between the United States and Mexico, you can do no better than "So Far from God." So Far from God: The U.S. War with Mexico, 1846-1848is available from amazon.com.